Ever dream about living at Disney World in Orlando. Yeah, we hear ya! But 99% of us can’t afford a home in Golden Oak. 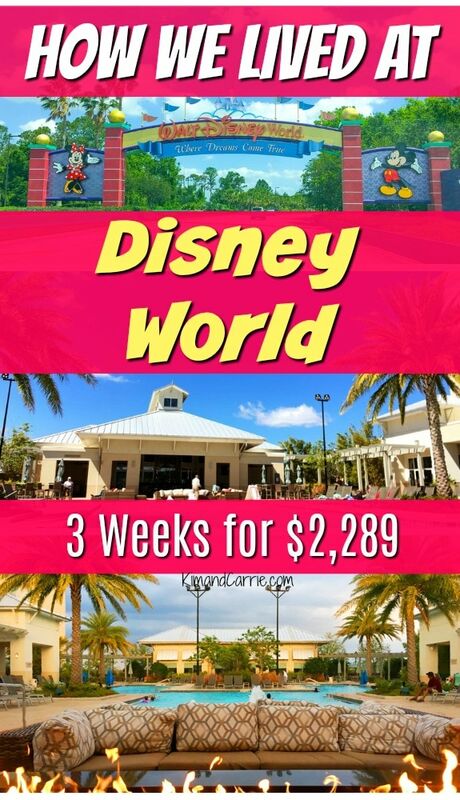 So we were thrilled when we were able to live at Disney World for three weeks for $2,289! That’s right! Just over $2,000 got us 21 nights just one minute from the entrance to Walt Disney World Resort in Orlando, Florida. We weren’t headed to Walt Disney World on vacation. In fact, it was just the opposite! My husband had a new job in Orlando. We had been living in a friend’s garage apartment for a few weeks until all of the job details were finalized. But we needed to get out of that garage apartment fast. And there wasn’t too many other fast and cheap housing options in all of the major Orlando area. After RVing for a year, we didn’t own anything. Literally, we each came back to Orlando with suitcases of clothes and that’s it. No towels, no dishes, no TV, no beds, no furniture, no pots or pans. Nothing. It’s the same situation if you are vacationing for a while. No one wants to have to bring the stuff with them. So we ideally wanted to rent a fully furnished home in Orlando. Which is either super expensive or way out of the way, with an hour long commute into the Disney or Universal area on I-4 (UGH!) or toll roads (expensive). An apartment wasn’t too much cheaper, and it came with NOTHING inside. So we would have had the expense of buying every single thing to put in a home, plus be stuck in a lengthy lease so that we couldn’t keep looking for a long-term place to stay. It seemed hopeless. Literally. Until I just happened to find a fully furnished condo that had just come on the market in the exact location we wanted and a price point that made us happy. But it wasn’t available for 3 more weeks. And we had to leave our current house now. We knew there was a couple new hotels that had opened up recently on Western Way near the Animal Kingdom side of Disney World. It’s the road just past Coronado Springs Resort and leads to a location called Flamingo Crossings. But for now, it’s blissfully quiet and uncrowded. Enjoy it while it lasts! 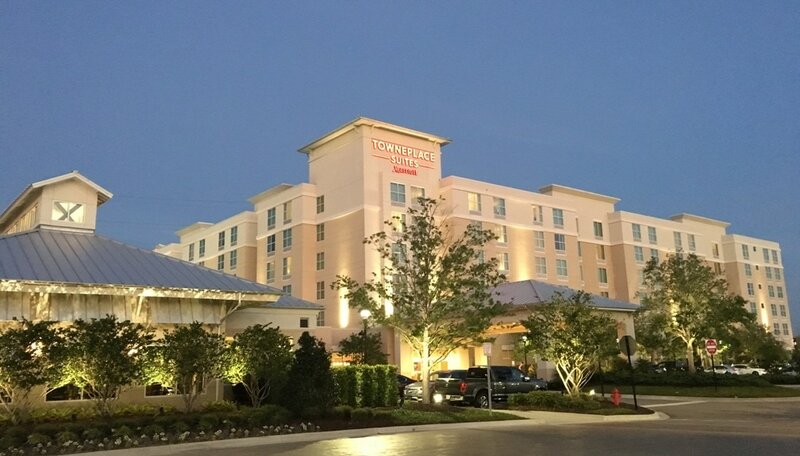 That’s where we found Towneplace Suites by Marriott and Springhill Suites by Marriott. Both properties are on the same site and share a common pool and restaurant. And they are the closest Marriott properties to the Magic Kingdom. The hotels are technically located in Winter Garden. So if you search for Disney hotels or only use Orlando as your search term, you might not find these extended stay hotels. Flamingo Crossings is seriously like a minute drive from the back entrance to Disney World. You get the whole big Disney welcome sign and everything. It is LESS THAN A MILE from Disney! It is right off of the 429 toll road. So easy to get off of the road and get to the hotel and Disney. 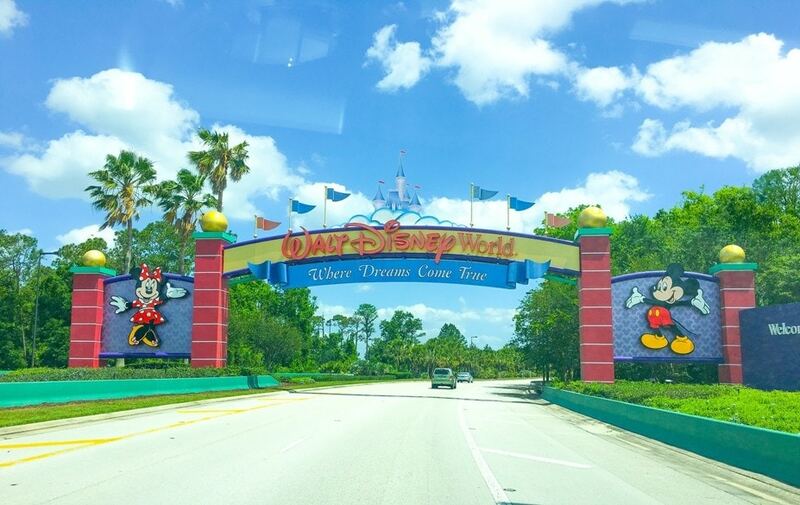 The exit shares two roads – one which goes to Disney and Hartzog Road which leads to the hotels. When you drive from Towneplace Suites to Disney World, all you need to do is get back on the road, keep driving straight, and you’ll instantly be in the backstage area where Disney’s Property Control is (the store that sells discounted and damaged Disney merchandise items to cast members). Then you’ll pass the bus entrance to Disney’s Coronado Springs Resort. You can either turn left to head towards Disney Springs, Disney’s Hollywood Studios and all of the roads that lead to Epcot and Magic Kingdom. Or you can turn right to head towards Disney’s Animal Kingdom and Disney’s Animal Kingdom Lodge. 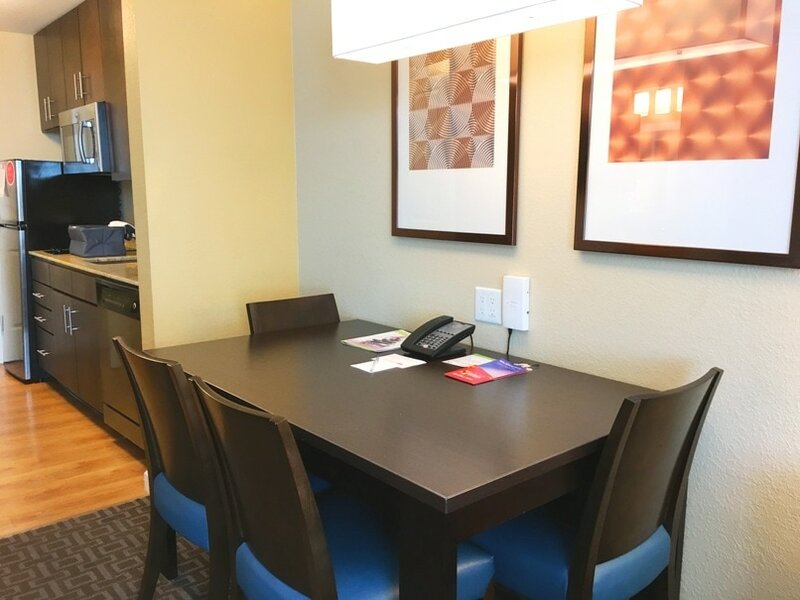 We were blessed and there was availability for a three week stay at Towneplace Suites by Marriott at Flamingo Crossings – and at a great price (we break down the costs below)! 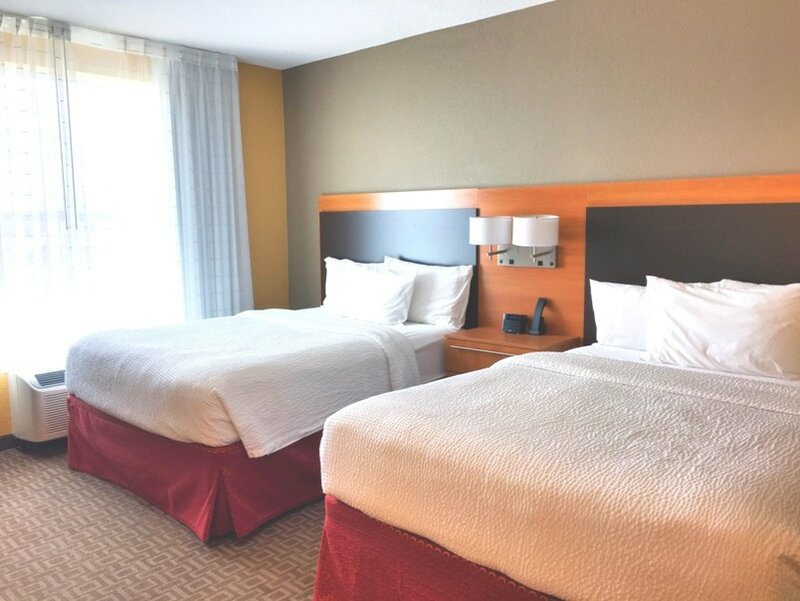 Towneplace Suites is designed to be a home away from home for all sorts of people. They cater to people who are in the area for a job for an extended time, like a month or three months. Or people who are in between housing situations, whether waiting for a house to be finished being built or financing to be complete. 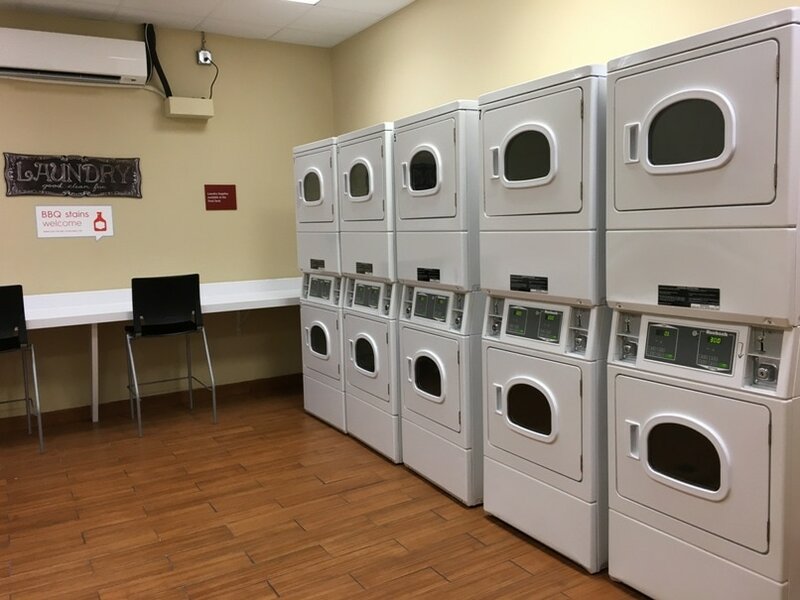 Located at the entrance of Walt Disney World, though, this Townplace Suites by Marriott is also ideally suited for travelers who want to feel like they are at home without a high price. The majority of people staying at Towneplace Suites at Flamingo Crossings were definitely on vacation and only stayed for 3 days to a week. However, there are people there who are living for weeks and months at a time. We saw many workers heading off to their job every morning. In fact, the video that plays on the TV channel for Towneplace Suites states that it is designed for business travelers and people in between housing. 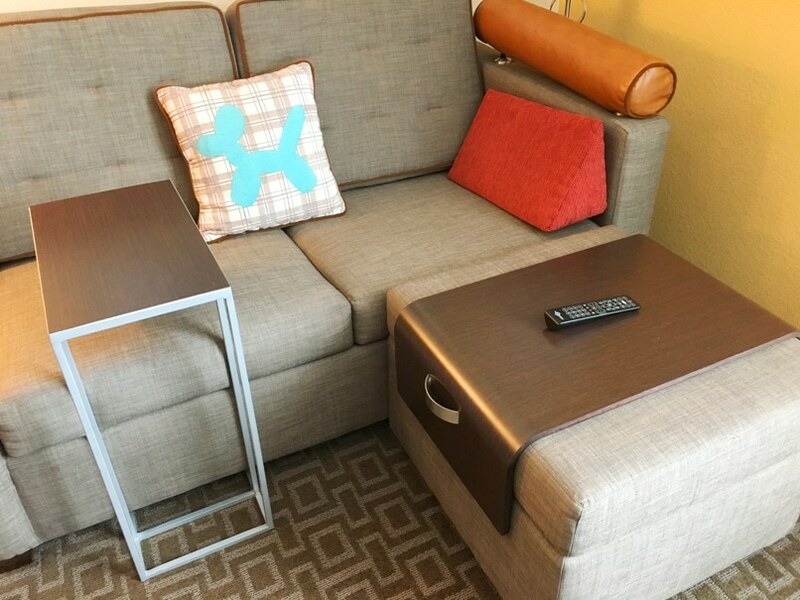 We loved Towneplace Suites at Disney World because it offered everything we needed to live without having to bring anything. The kitchen has a large refrigerator and freezer. It definitely can fit a lot of food and drinks, including large gallons of milk or water. There is a two burner electric range, as well as a dishwasher, microwave and deep stainless steel sink. The brilliant part of an extended stay to live at Disney World is you can even borrow bigger appliances and grilling supplies from the front desk. Through their borrow program, you will be able to use a slow cooker, blender, rice cooker, grilling utensils, grilling spices and more, including board games and playing cards. The kitchen isn’t the only thing designed for long term stay to live at Disney World. The closets have Container Store systems inside, creating a huge space to store clothing and personal items. They come with multiple levels of shelves and a pull out drawer. A laundry basket is provided for doing laundry in their large laundromat downstairs ($3 each for a load of washing and drying). The dining room table doubles as a place to eat and work. The couch is designed to have only one armrest, so that people of all heights can easily stretch out and lay down on it. A lap desk is provided to work in bed. The hotels are pet friendly. Large gas grills are available at the pool area, and they are nice! An additional pavilion by the parking lot has lots of gas grills and picnic tables and batting cages for baseball. We needed to stay for several weeks right in the middle of one of the many high seasons in Orlando – Spring Break. And if you’ve ever priced out Spring Break travel to Disney World, you know it can be expensive. And the date range lasts for about a month, because all spring breaks take place at different times. We were really dreading the cost of trying to live in a hotel during Spring Break in the attractions area of Orlando. However, God always takes care of us, and we found an amazing deal in the perfect place that was truly a blessing! Two days before we needed to check-in, I searched availability online at Towneplace Suites at Flamingo Crossings. The price was $109 per night. The per night price came down as I modified the length of stay. So, when I put in a week stay, it was more expensive. When I added another week, it went down. When I added more days, the price came down to $109 a night. During Spring Break. Living at Disney World. When I went back to the website the next day to possibly modify my reservation, the price had skyrocketed. Keep in mind, it was 24 hours prior and the start of Spring Break season. But the price had soared to $169 a night. And it didn’t go down no matter how many nights you put in. Plus there was no more availability for a long term stay like ours. We were definitely Blessed to get our reservation when we did! We have heard that the rates at the Towneplace Suites extended stay hotel have gone down to about $85 a night for long-term extended stays. Talk to the Sales Manager to make a reservation if you intended on living at Towneplace Suites for more than a couple weeks because they can possibly get you a better rate than online. Keep reading to see why this is an affordable way to live at Disney! Not only did we live at the doorstep of Walt Disney World, but there were some other great perks from staying in an extended stay hotel. At Towneplace Suites at Flamingo Crossings we had FREE internet. It was the basic Marriott package, but it was a fast speed package that was more than adequate for business work, including uploading and editing photos and doing social media. That is a perk of being a Marriott Rewards member (it’s FREE to join). No parking fees! This was a huge selling point! We knew with two cars that if a hotel charged us for parking the price would be crazy high. Even Disney charges parking fees now to stay at their hotels on Disney World property. Reward points! As a Marriott Rewards member, I was earning points to go towards future stays. You will earn points (or miles, however your program works) with every night. The longer the stay, the more points and seniority you will have in the Marriott Rewards program. If you come in with an elite status, or have signed up for a special promotional offer, you can gain a lot of points! These can be used for free hotel night stays for future vacations. Cash Back or Points when you pay with a credit card! If you pay using a credit card with cash back bonuses on travel, you’ll score big time with this unique way to live at Disney. Free gym. No need to pay for a fitness center membership. 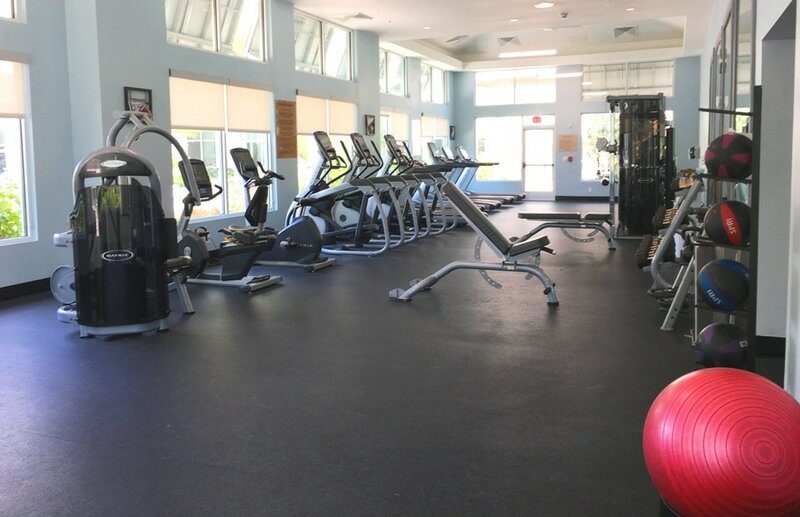 If you live at Disney World at Towneplace Suites at Flamingo Crossings, they have a great gym. Plus a pool. Free breakfast. Okay, we wouldn’t actually recommend going down to breakfast if you are living at the hotel because it is crazy down there. No matter what time you go down, the lines are long and the food isn’t as great as I’d hoped (Mickey Mouse waffle makers are cool, but the lines are long. Otherwise, it’s yogurt, bread, bagel, cereal, and a hot options, such as a type of egg and either ham or another meat). But if you don’t mind the drama, you can get a free meal a day when you live at Disney World in an extended stay hotel. Make your own meals. 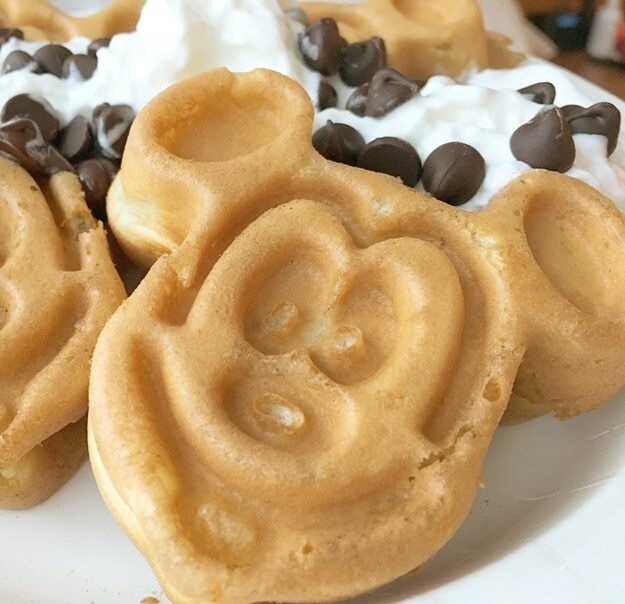 Prepare your own meals and save lots of money while staying at Disney. A Target is just a mile away on 192 and a Walmart is a few miles up the road on 429. 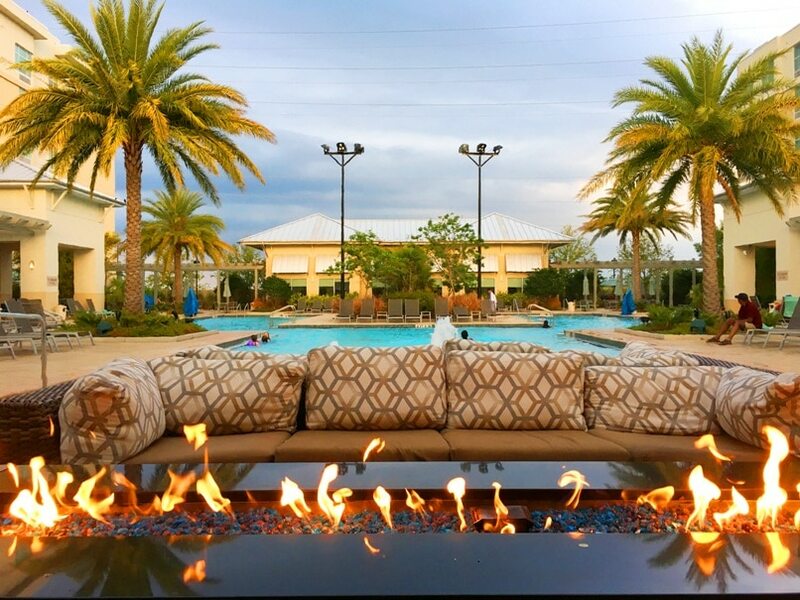 Keep in mind, if you are seriously trying to find long-term housing in Orlando, staying at Towneplace Suites gives you flexibility with no early termination fees from apartment housing and no cleaning and administrative fees often associated with Disney vacation homes and renting a condo at Disney World. Thank you for sharing this! I usually stay inside the Disney bubble but I’m contemplating a longer stay next time and this is an excellent alternative. Thanks, Ruth. 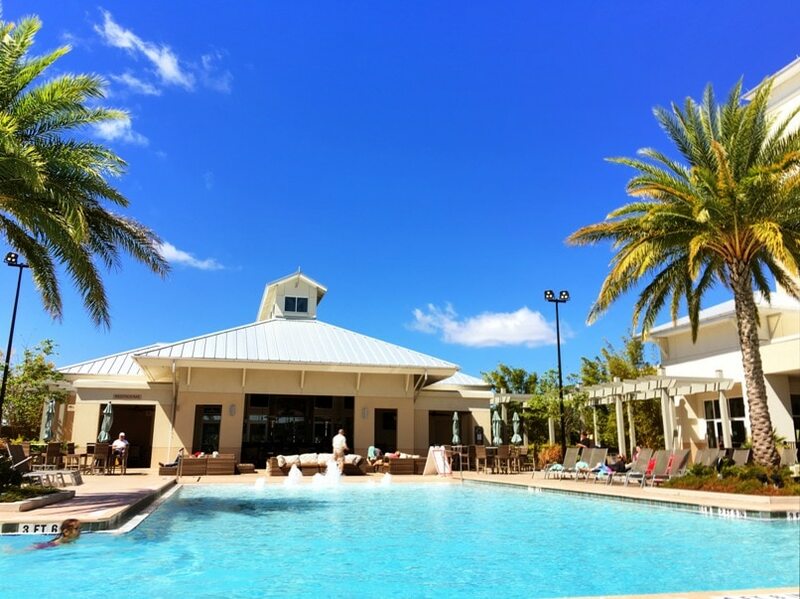 We truly did enjoy staying at Towneplace Suites and it is SO close to all of Disney World. Seriously. It would take minutes to get to Disney Springs. We loved the serenity when we stayed there, but being close to everything Disney had to offer. Hope you consider it for your next travel adventure!